Hand, foot and mouth disease (HFMD) has been associated with large outbreaks among young children, including severe illness and fatality, in the Asia-Pacific Region since 1997. Severe illness is most often associated with enterovirus A71 (EV-A71). Vietnam experienced a large sustained outbreak of almost 200.000 hospitalised cases and over 200 deaths in 2011-12, the large majority occurring in southern Vietnam. A prospective study was conducted in three referral hospitals: Children’s Hospital 1, Children’s Hospital 2 and Hospital for Tropical Diseases. Patients were enrolled from all severity. Between July 2013 and July 2015, 1547 children were enrolled. Four serotypes of EV-A71, Coxsackie virus (CV) A6, A10 and A16 were responsible for 1005/1327 (75.7%) of diagnosed cases. We found an unexpected dominance of EV-A71 among both in and outpatients, and a strong association with severe illness. CV-A6 and A10 emerged in Vietnam during our study period and replaced CV-A16. CV-A10 was associated with different clinical and laboratory characteristics. Our analysis revealed the persistence of EV-A71 subgenogroup B5 in Vietnam from 2013 to 2015 without any major outbreak notification despite the observed high level of genetic diversity of EV-A71. The relative genetic diversity of subgenogroup B5 increased sharply in 2012, leading to subgenogroup switch from C4 to B5 and then remained stable from 2013 to 2015. Subgenogroup B5 were dominantly circulated in Vietnam during the study time and might import to Vietnam from two independent sources. Results from this study, covering demography, clinical features and virology, provides a full view of HFMD in Southern Vietnam and therefore may have great impact for disease management and control. 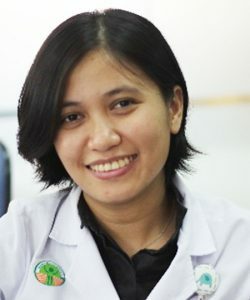 Hoang Minh Tu Van earned her Bachelor of Medicine from the University of Medicine and Pharmacy – Ho Chi Minh City in 2007 and worked as a General Practitioner for one year before taking the Master of Medicine (Infection and Immunity) course in University of Sydney – Australia. Back to Vietnam, she worked as both a clinician and researcher in Children’s Hospital 2 for six years. Van has completed her PhD thesis with Oxford University, entitle “ Clinical characteristics, virology and host genetic markers of Hand, Foot and Mouth Disease in Southern Vietnam” and now she is a post-doc researcher in Oxford Clinical Research Unit, Vietnam.